There have been a few postcards recently posted up on ebay. I have included these below. 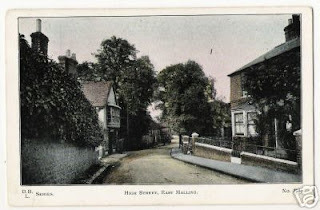 (1) The title of the first is "High Street, East Malling". The publisher is D.B.L Series No. 3956. The description is "colour printed postcard postaly used dated 1910 with a half penny stamp". (2) The second is a unused postcard with a real photo. Name over shop is GH Standen. Under window is Parker & Son. No date unfortunately. Early 1900s I would expect (does anyone remember the shop, or know of a more exact date for the photo?). These postcards are currently being auctioned on ebay should anyone be interested in making a bid!